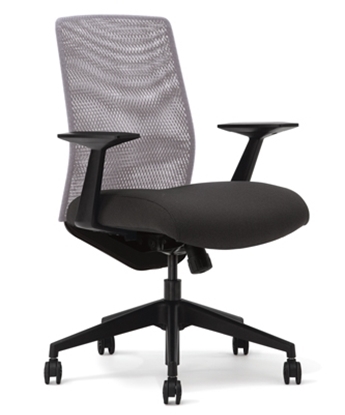 Bolero combines style, functionality and ergonomic comfort in its simple modern design. 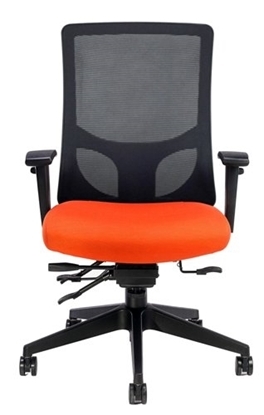 The chair features fixed cantilever arms and the back is breathable, comfortable and provides solid support. 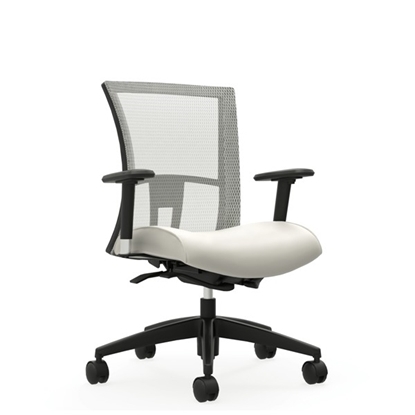 The Bolero chair is versatile for use in a conference room or executive office. Order now and get free shipping! 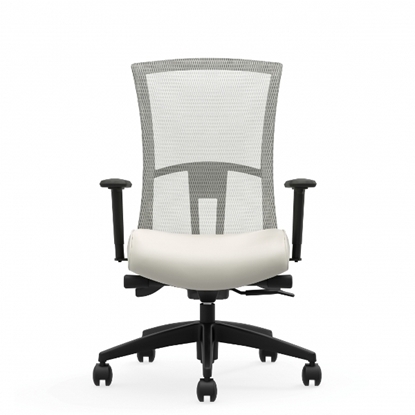 Beautiful, breathable the Weev Mesh Office Chair from Global is inexpensively priced. 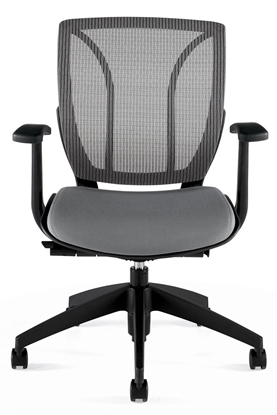 The black mesh back is woven to breathe and give as the user leans into it removing pressure points along the spine. 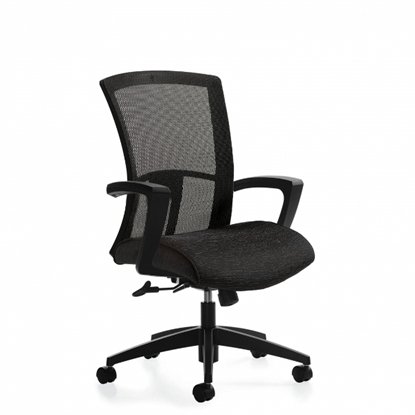 Sit comfortably at your desk or in your conference room in this comfortable and stylish mesh back chair. This chair features an aluminum base, height and width adjustable arms, and a basic synchro-tilt mechanism. A modern chair that can be used in conference rooms, private offices, home office, cubicles, and in any other setting. 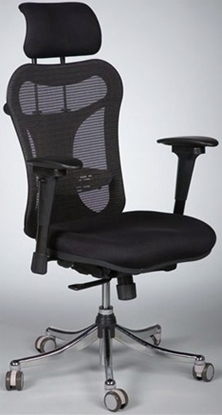 This chair features a mesh high back design, tilt tension control, and height and width adjustable arms. 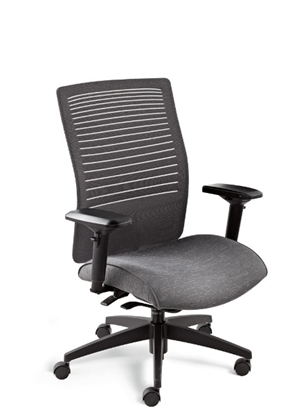 The lower back version of our popular executive mesh office chair, this model features the latest engineering techniques with air-flow mesh technology for a comfortable seating experience. Global's waterfall seat edge helps reduce pressure at the back of the knee, improving circulation. Warranty and free shipping available. The Highmark Bolero combines style, functionality and ergonomic comfort. 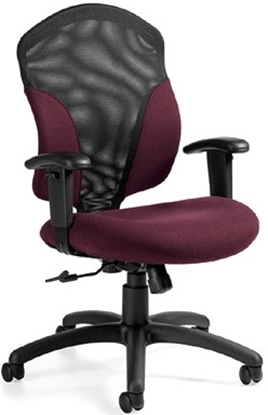 This modern office chair features height adjustable arms and a breathable back. Available in three (3) mesh back colors and a wide variety of seat fabrics. Order today and get free shipping! Vion offers a clean transitional design and exceptional comfort at a tremendous value. 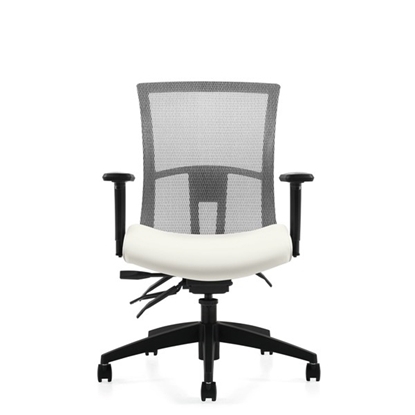 This mesh office chair can be used in almost any office setting ranging from collaborative work spaces to private offices to conference rooms. Customize its look by selecting one of its 5 quick ship mesh backs and one of its many fabric seat choices. A great addition to any home office, private office, or general work area, this chair features a weight sensing synchro-tilt mechanism that eliminates the need for multiple adjustment paddles making adjustments simple and providing exceptional comfort. 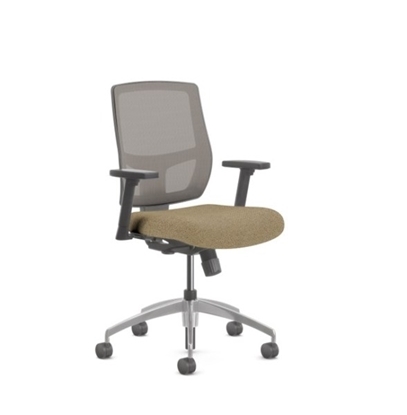 A modern styled office chair, The HB 7107M-S2-A40 from Highmark is versatile enough to be used in a cubical, an executive office, or around a conference table. This chair features a swivel tilt mechanism and is available in 6 breathable mesh back colors and numerous more seat fabric choices. Order today and get free shipping on all chairs! 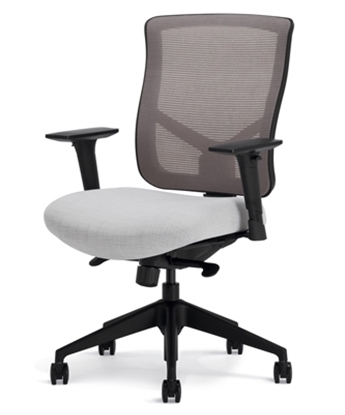 A beautiful, breathable mesh office task chair from Global at an affordable price. The Weev black mesh for the back of the chair is woven to breathe and give as the user leans into it removing pressure points along the spine. 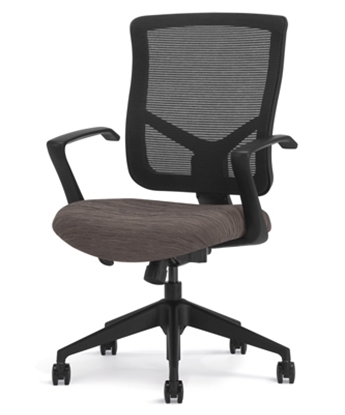 This modern office task chair combines style, functionality and ergonomic comfort. The Bolero by Highmark features height and width adjustable arms, a seat slider and a wide variety of fabric choices. Perfect for use with a home office desk or computer workstation. A great choice for the home or executive office, this high back office chair features a Synchro-Tilts mechanism with back angle adjustment. This chair is available in a large number of fabric seat choices and mesh back colors. 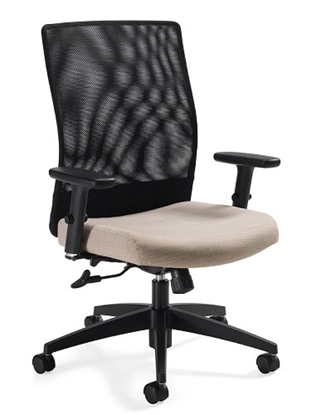 The Roma mesh back office chair by Global has a breathable back, providing excellent comfort and support. Featured in Black, there are multiple color choices help you coordinate this modern chair with your business or home office decor. Order today and get free shipping! The Balt Ergo EX mesh office chair is the ultimate in pneumatically adjustable ergonomically designed chairs. Simple to use dial in lumbar support. Featured in Black mesh with an attractive polished metal base. Perfect for a home office or matching with an executive desk. Warranty and free shipping available. Loover is Global's first office chair to feature the weight sensing synchro-tilter, that requires no tilt tension adjustments. It is always set right, for everyone. 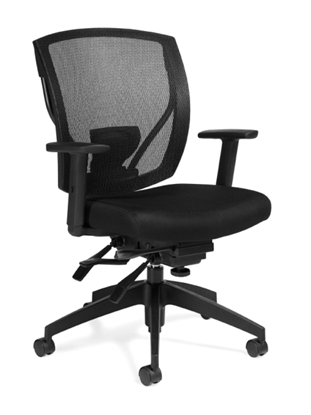 This executive chair also features a live lumbar support that is incorporated into the back design which is height adjustable via a concealed ratchet system and G5 lockable arm caps that are height, depth and width adjustable to suit user preference. Order today and get free shipping!